Although they may look very similar from the outside, charter buses and band tour buses are different in many ways. While both are premier group transportation solutions equipped with a number of premium features and amenities, they serve a number of different groups in several ways. Having a hard time figuring out what differentiates the two types of motorcoaches? GOGO Charters has taken the time to break down each solution’s purpose, features, and functionality below. Take a moment to look and decide which solution works best for your group. Charter buses are built for more traditional transportation of groups. Typically, a charter bus is booked to transport bigger groups of passengers to and from large-scale events such as sports competitions, corporate conferences, school field trips, weddings, and more. Larger groups like these need fast, scalable, efficient service, and that’s exactly what a full-sized charter bus provides. Also known as “sleeper buses”, “entertainer buses”, or “nightliners”, tour coaches are built with artists, entertainers, and other high-value clients in mind. These motorcoaches often transport Rock & Roll bands, touring comedians, politicians, performing artists, and their crews over long distances– often hundreds of miles at a time. 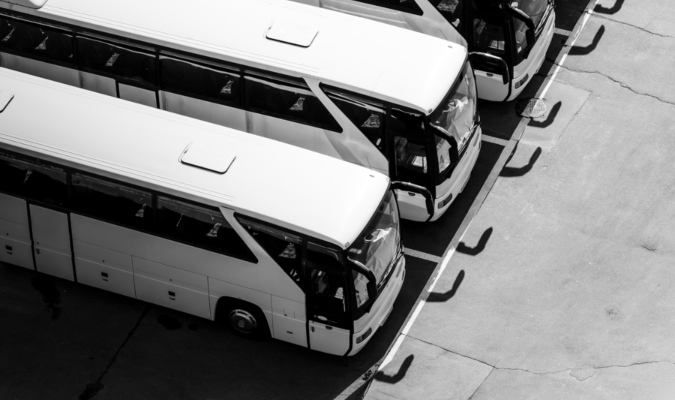 Charter buses are able to accommodate large numbers of passengers– far more than a tour bus. Although they can range in size based on provider, the largest charter bus that GOGO Charters provides seats up to 56 passengers. The size of the motorcoach allows football rosters, huge corporate teams, and the largest classes the ability to transport more passengers with fewer vehicles. Entertainer buses are often the same size as charter buses, but their construction and accommodation limits are far different. Standard entertainer buses have fewer seats on them, typically enough to accommodate 35-40 passengers. Seats also face perpendicular to the bus, while a charter bus’ seats all face forward, toward the driver. Charter buses come loaded with a bunch of premium features, designed to maximize the riding experience. Because a wide array of passengers typically book charter buses, they may be equipped with features such as WiFi, restrooms, reclining seats, power outlets televisions, DVD players, luggage bays, radios and more. Sleeper coaches are also built with an array of luxury amenities, designed to cater to high-level executives and talent. Not only are these motorcoaches equipped with traditional charter bus features such as WiFi, televisions, and restrooms; but they also feature add-ons such as GPS navigation, a full kitchen, showers, dome lighting, front lounge slide-outs, and anywhere from 8 to 18 bunk beds (with 12 being the average amount). Luxury tour buses and entertainer coaches may even be fitted with blacked-out or mirrored windows, allowing their passengers to see out but preventing fans and the public from seeing in. Charter buses are known for their great storage options. Because they transport so many people, they are constructed with a full row of luggage bays found below the main cabin. Passengers can pack multiple bags for long-distance excursions. Because entertainers are often on the road for months–and even years–at a time, their buses come equipped with a bevy of storage options. Different storage locations can be found in a number of places on the bus, from the lounge areas and kitchen to the luggage bays and bed bunks. If an entertainer is traveling with their crew, there may even be an additional trailer that follows the music tour bus to carry lights, stage equipment, and any other supplies required for a show. While both models are similar in size and construction, it’s apparent that there are some clear differences between charter buses and entertainer buses. If you’re not sure which motorcoach fits your group’s needs most, reach out to GOGO Charters today by calling 1-855-826-6770 for more information!